I started backpacking when I was 11 and for the last 15 years have enjoyed California's central Sierras. For the last 5 years I've been out 59 of 60 months; with a goal to match my age in nights out each year; about 30 solo. For comfort I lug tent, mattress, chair, etc. Typical summer trips run 5-8 days; 40 lb (18 kg), about half food and water related; about 5 miles (8 km) per hiking day. I winter camp most often at 6,000 to 7,000 ft (1,800 to 2,000 m); 2 to 3 nights; 50 lb (23 kg); a mile or so (1.6 km) on snowshoes tugging a sled/fire pan. CARE: Machine wash cold with fasteners closed, delicate cycle; no bleach; tumble dry low to reactivate waterproofness; remove promptly after wash, tumble dry; cool iron if needed; no dry clean; no fabric softener; mild detergent only. COLORS: Solid Black, Gold, Blue, Gray shown on website; Green received. Arrival Condition: Carefully folded in a plastic bag with garment tags attached. I found no loose threads, cranky zippers, wrinkled seams, broken cord locks, discoloration or other defects of any kind. This 2-layer waterproof breathable shell top comes in at a feather-light weight for a full featured jacket. Cuffs have hook and loop adjustment. Full front zip. Seams are taped inside. The hood has an almost bill-like stiffener across the top; and a drawstring adjustment with cord lock on each side. The back has a vertical hook and loop strip for tucking up the hood to keep it from falling down on the forehead. The tail is a couple inches (5 cm) longer than the front, and the bottom hem has a drawstring adjustment with cord lock on each side. An outside pocket on each side of the jacket both have zip closures and double as vents. Each holds a medium-size glove or accumulation of stuff to that volume. Interior zip pocket on the left side near zippers provides convenient storage for glove liners or a GPS and food bar; located just right for the right-handed. The trunk part of the jacket inside is lined with black mosquito netting-like material; sleeves and shoulders have black taffeta lining. The jacket model is mono-color, this one being an olive green. The website presently shows it available only in black. There are no pit vents. Adidas refers to the polyester material as dobby. Wikipedia says dobby is characterized by small geometric patterns and extra texture in the cloth. I see the standard ripstop type of pattern; have never previously seen it referred to as dobby. I find this one of the lighter waterproof-breathable shells in my gear closet and by far the softest to touch. I wonder if the polyester will pill or snag; or if it will shed water as well as "harder" material. Testing may reveal the answer. I'm counting 3 layers--outer, laminate and netting/nylon liner. Maybe without the laminate wearing directly on clothing it may take longer to rub off. I like 2-layer shells for how light they typically are; though I don't care for the feeling of the laminate directly on the skin. Most often I find when I'm backpacking the internal moisture production exceeds the garment's capacity to vent; so I often wear only the jacket for spring showers in order to keep the shirt dry for use in camp. Perhaps this jacket will breathe better than laminate directly on skin. This jacket fits me perfectly over 2 shirts, which would be typical camp wear for a wet outing. I wore it in the house for an hour or so and while I got way too warm, I didn't get the slightest bit damp inside. Not much of a test being at rest inside, but so far very comfortable. The sleeves are long enough to cover my hands. I like that when it's windy and cold but I don't want to wear gloves. I like that the tail is a little longer. I may have a chance to find out if it's long enough to keep the rain out when I lean over. The only thing I notice not on this jacket is pit vents. If I think I need those, I can always choose a jacket that's a lot heavier. I like pit vents, but if the choice were that or lighter or lining twixt skin and laminate, I likely would always choose the latter two for 3-season use. 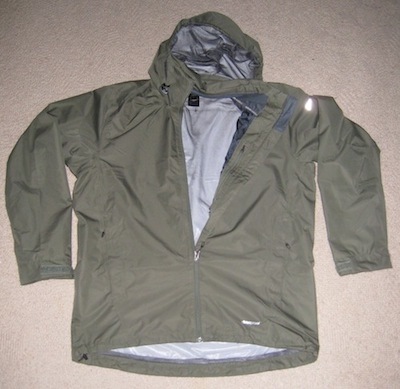 My initial impression is one of considerable amazement that a waterproof-breathable shell can have so many features and be so wonderfully comfortable at such a light weight and price. April 25-26: Backpack camping, Pt. Reyes National Seashore, CA. 1,000 ft (300 m); 60-45 F (16-7 C); breezy, gusting winds; partly hazy skies and then dark; 7 hours. May 6: Streetwalking, 100 ft (30 m), 60 F (16 C), 3 mi (5 km), sprinkly, 50 minutes. May 15: Beyers Lake Trail, Tahoe National Forest, CA. Backpack camping; 6,800 ft (2,070 m); 45 F (7 C); showers, hail; 4 hours. Jun 15-18: Mt. Shasta, CA. Backpacking and hiking; 6,950-10,200 ft (2,100-3,100 m); 15-35 F (-9-2 C); snow, intermittent sun, cold; 8 hours. Camped in the shade at Pt. Reyes without fire I was cold enough to need 2 shirts, a synthetic vest and the Wandertag jacket, which I wore from about 4pm until just after 11pm. I found the jacket cut the wind completely, yet I never felt muggy. The inside of the jacket had no moisture on it. I liked having the long sleeves that kept my hands out of the wind. I felt unrestricted by the fit. The hood worked well, though the "bill" would not stay in an upright position and frequently interfered with my headlamp. An adjustment may mitigate or resolve that issue, which I may feel motivated to try on the next outing. On my street walking jaunt I hauled 10 lb (4.5 kg) of packages in a backpack to the post office. I was otherwise wearing a short-sleeve cotton tee and hiking shorts and got very warm. On the way back I unzipp ed the jacket completely. I wouldn't have worn it to begin with except for the chance to try it out in the rain, which never really developed. Internal moisture exceeded the garment's breathability. The sleeves were getting wet inside, especially nearer the cuffs. Given how warm it was and that I was walking as fast as I could for nearly an hour, I'm not surprised at these results and have no experience with waterproof breathable shells that do any better. What tiny bit of water that gathered on the outside of the shell beaded and did not penetrate. I like the soft feel of this hard shell. I did not notice as much crinkling sound as on other hard shells. A five-day outing in Tahoe National Forest gave purpose one day to an essentially sedentary test. I put the hood over my head and the rest of the jacket over the backpack for about half an hour until I capitulated to the weather and found a spot in the trees to camp, shown in the top photo. Thundershowers, hail and cold air downpours eventually relented as the cells dissipated, downgrading to annoying drizzle in cool and calm conditions. I'd put the jacket over a heavy tee and a light long sleeve at 5pm and kept it on until going to bed at 11pm. I was comfortable during missions away from the fire tending camp chores; and more surprisingly I did not get muggy sitting at the fire. I also didn't get wet down the back of my pants; evidently the tail is long enough. A brimmed hat kept the jacket hood from slipping down and I did not find need to try any adjustments. Water beaded on the outer shell and did not saturate the fabric. In fact I merely shook it off and put it in the tent, waking up to find it completely dry. Capricious weather squelched my chances to summit Mt. Shasta, but did provide splendid test conditions for the jacket. I left the car at 6,950 ft (2,100 m) in a dump of new snow which did not relent at 8,000 ft (2,440 m) where I decided to camp. 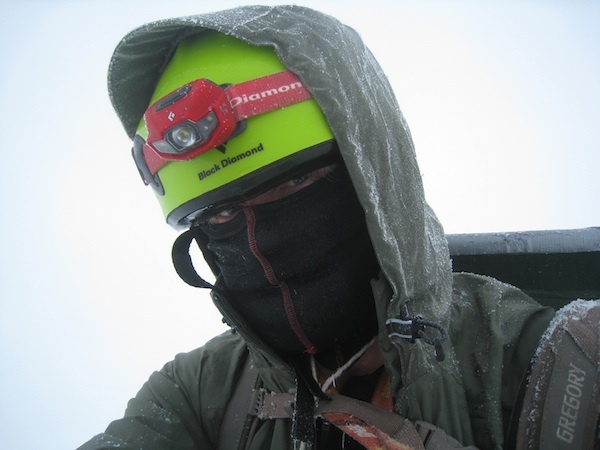 Most of my hiking was then below freezing, and I'd estimate about 15 F (-9 C) ambient when I took the selfie in a 6am whiteout at 10,200 ft (3,100 m) Helen Lake where I felt surrender the best option. I was toting about 10 lb (4.5 kg) wearing only a mid-weight wool base top under the jacket and felt pretty comfortable until I hit the arctic blast at Helen Lake. I had to close up the cuffs and zip to the neck for the hike back down to camp. Extended hiking with a pack got the back wet, of course, but the jacket remained dry elsewhere. I am very satisfied with how effectively the jacket keeps out cold air, yet breathes well enough to keep things reasonably dry inside even under heavy exertion. I like that the hood is the exact right size over my helmet, with the hook/loop adjustment to pull it back when not wearing a hat. I struggled with bare, cold fingers to find the zipper pulls on the outside pockets when I changed to heavier gloves. The inside pocket keeps the camera in perfect position for easy access, and warm enough the battery didn't freeze. The sleeves are long enough not to expose my wrists when working with trekking poles, and stay folded back when I want my hands out doing camp chores. With cuffs open my arms got enough ventilation to keep dry. When too much cold air blew in, closing the cuffs sealed up the sleeve to keep my arms warm until I got out of the wind and could open them up again. I can work the hook/loop adjustment with gloves on. I don't have enough room to wear a heavy coat under the Wandertag, but I can't think of why I would want to. The tail is long enough I can lean over without exposure above the top of my rain pants. So far the DWR finish works well enough I can shake off most of any drops on the jacket; and I found it would even dry somewhat overnight inside the tent, where temps ranged from 24-35 F (-4-2 C). I am very satisfied with this jacket's performance; and it weighs about a half-pound (225 g) less than others I have used for this kind of hike. Jul 5-12: Yosemite Wilderness, CA. No inclement weather. Jul 23-26: Waldo Lake, Oregon, USA. No inclement weather. When conditions were too dry and mild to need the jacket, it still made a passable increment of pillow pile. I like this jacket a lot. I have several hard shells, and this has become my favorite. I have no suggestions for improvement; it suits me perfectly as is. It may never rain again in California, and likely I will not be carrying a hard shell again until it does. Thank you Adidas and BGT for the opportunity to test this shell top. This report concludes the test.